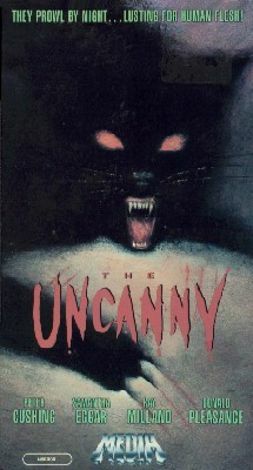 Usually, an anthology film such as The Uncanny has a built-in problem, namely: is it better to schedule the strongest segment at the beginning and get things off to a bang or at the end, and hope the audience stays with you that long? Uncanny manages to avoid that dilemma by the simple trick of having no strongest segment: each of its trio of tales is as weak as the others. It's a dubious distinction, but it's also about the only distinction to be had by this trilogy of the terrible. Under pressure and forced to choose, you could perhaps describe the last segment as the most entertaining (or perhaps the least intolerable), merely because Donald Pleasence is on hand to give one of his overbaked performances that may not be good acting but at least has the benefit of providing distraction. As might be surmised, the screenplay is total hack work, and not even decent hack work at that; there's precious little to keep one's attention, and there's not even logic to the premise: Peter Cushing's character may wish to present evidence that cats are evil creatures, but the stories basically paint the creatures as avenging wrongs done to basically innocent people. The cast tries hard, but there's nothing they can do.